Begin by filling your feeders at the same time every day, preferably in the early morning, when birds actively seek food. Include a few chopped walnuts or pecans, which many birds relish, where the birds can get at them immediately. Certain birds will catch on and show up soon after you visit the feeder. Spend some time near the feeder, watching them calmly, maybe at times talking gently - to get the birds used to you. One day, don't fill the feeder but stand or sit at the expected time near the feeder. Place feed in a cup formed by your palm upturned and fingers pointing up for a perch. 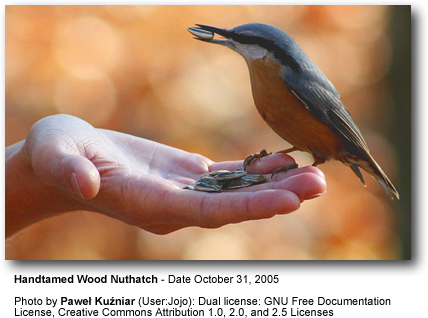 Birds see well from a distance and will easily notice that you are holding feed. Don't get discouraged if they don't come that day. It's fine to talk gently, but avoid sudden movements. Be patient. One of the braver birds will eventually take a piece from your hand. It may even hop onto your fingers and will, hopefully, be rewarded with a nice treat. Soon others also will come. Refill the feeder when you are done.